Today former IL congressional candidate Tim Bagwell PhD (who now lives in St. Louis) and I asked our congressmen, Reps. Lacy Clay (D-MO) and Rob Woodall (R-GA), to help us get answers regarding an institutional cover-up by the Centers for Disease Control and Prevention (CDC) that involves CDC Director Thomas Frieden MD MPH. Our thoroughly-documented letter requested that Reps. Clay and Woodall ask Dr. Frieden to account for millions of tax dollars the agency awarded to the Save-A-Life Foundation (SALF). As Sidebar readers know, SALF was a politically-connected Chicago nonprofit that's been the subject of dozens of media exposes and is reportedly under investigation by the Illinois Attorney General for the "possible $9 million misappropriation" of federal and state tax dollars. Our letter also asked why CDC executive Douglas R. Browne was permitted to moonlight as SALF's corporate treasurer while the agency was funneling millions to the group. Would you please ask Dr. Frieden to provide you with a thorough accounting of how the $3,335,578 awarded to SALF was spent? 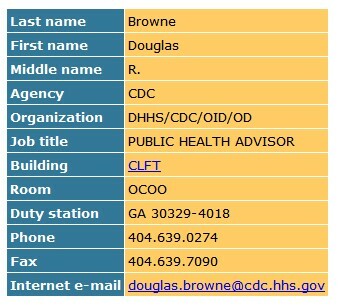 That should present no difficulty for him since SALF's corporate treasurer Douglas Browne, still a CDC employee, should be able to provide him with the records. Click here to download a copy of our letter.